Let’s pretend for just a moment that you were a public speaker who lived back in Shakespeare’s time (1564 – 1616). Forget all of those presentation tips that you’ve learned because all of your PowerPoint slides are now gone along with your fancy audio mic systems, and your embedded YouTube videos. It’s just you up there. What’s going to allow you to connect with your audience using their just their listening skills? All that you have working for you is your voice – you’re going to have to really learn how to use it. Wouldn’t it be nice if you could work with a voice coach who could teach you how to get the most out of your voice? What would make that even better would be if you could work with Cicely Berry. She’s been the voice director for the Royal Shakespeare Company for the past 42 years. Yes, you read that correctly – the past 42 years. What she does better than anyone else is to work with actors in order to help them to meld their voices with the voices of the characters in Shakespeare’s plays. No small feat considering that these plays were originally written for people who lived over 400 years ago! Although you and I might not be earning a living putting on “Romeo and Juliet” each evening, we can still learn a great deal from what Cicely has to teach us. The more that we can meld with our words, the more powerful our message is going to be for our audience. The first thing that Ms. Berry points out is that back in Shakespeare’s day the importance of public speaking was critical: only a very small percentage of the audience had the ability to read. This meant that their vocabulary might not be all that large. 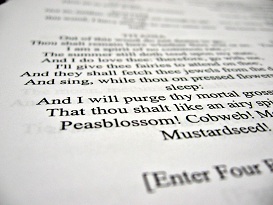 When the actors delivered their lines on stage, much of the audience would get the message of what was being said as much from the rhyme and the sound of the words as the words themselves. Next, Ms. Berry works with the actors in order to teach them how to move and speak at the same time. We could all learn a thing or two about how to do this better. Cicely says that your ability to move while you are speaking allows you to underscore the flow of your words and add both sound and muscularity to what you are saying. She points out that taken together, there is a rhythm to all of this that helps to communicate the meaning of what you are trying to get across. How we say our words has a lot to do with how our audience hears them. Ms. Berry works with her actors in order to get them to have a good resonance in their chest. By doing this, they can become more expressive and add variety to their voice. Cicely’s final piece of advice for her actors is for them to truly study the lines that they are going to be delivering to their audience. She wants them to understand how fast to say them. Also, she wants them to take the time to learn how much to stress them. She realizes that this information isn’t written down like it is for a piece of music, instead we as speakers need to discover it for ourselves. Thankfully we don’t live back in Shakespeare’s time; however, that doesn’t mean that we can’t learn a thing or two from those days. Cicely Berry has been working as the voice coach for the Royal Shakespeare Company for the past 42 years and she knows a thing or two about the benefits of public speaking and how to use your voice. Her goal is to get speakers (actors in her case) to think out the rhythm of what they are going to be saying. She also wants to make sure that speakers understand how to move while they are speaking and to have the words work with the movements. Instead of just standing at the front of the room during your next speech, learn from Cicely and use your voice to become your speech. By doing this you’ll draw your audience into your speech and you’ll change their lives forever. Question For You: How important is it to work your voice into your physical movements as you deliver a speech?